This native of the American Southwest is well adapted to hot, dry conditions. 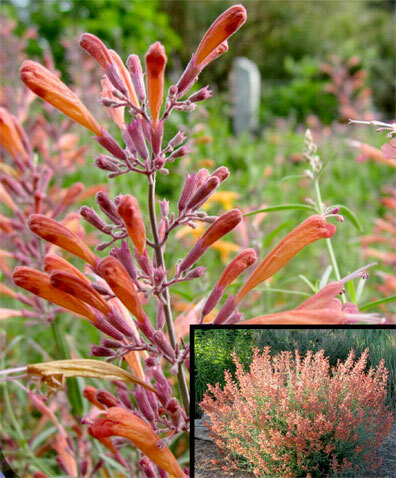 Its bold spikes of sunset-orange flowers have a wonderful root beer aroma and its gray-green foliage smells like anise. It is very long-blooming, particularly if deadheaded. Sunset Hyssop can tolerate most any kind of soil, but it needs good drainage. It needs moderate watering, but once established, it is drought tolerant. Rabbits don’t like the licorice scent in the foliage, but hummingbirds love the flowers.